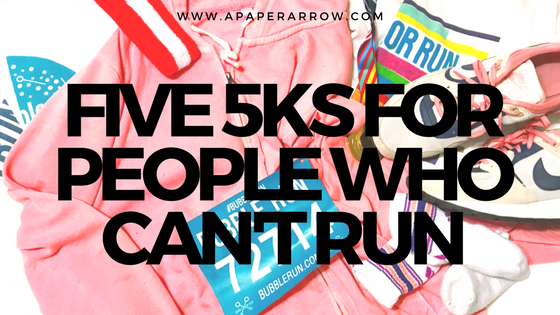 If you've been following along for a while, you'll know I like to do 5k fun runs. I struggle to actually run, because I have exercise-induced asthma and shin splints, but fun runs are a terrific way to participate in physical activity and have fun, without feeling like trash for not actually being a runner. Here are five really neat opportunities to participate in even if you're not necessarily a runner. A color run was the first fun run I really participated in, and what really got me into participating in 5ks, at least annually. There are a variety of different runs to choose from, but typically each race includes colored powder (which is basically cornstarch) that gets tossed at runners during different "check points" throughout the three miles. There's typically a festival after the run that includes a live deejay and more colored powder tossed into the air. Tip: Make sure to wear clothes and shoes you don't mind getting colored. The colors mostly wash out, but some may remain - a white shirt is a fun options. Also, put your phone in a zip baggie if you plan to take pictures. Bubble runs are very similar to color runs, but instead of powder - you've got colored bubbles. You literally run/walk/jog through checkpoints of colorful bubble walls. Tip: Bring extra shoes. The bubbles get your feet wet, and who wants to spend the rest of the day with wet feet? Go for the phone in a baggie trick again, so no moisture gets inside. These can be anything from the March of Dimes to the Cupid's Undie Run to the JDRF One Walk for type one diabetes research. A lot of times these runs don't have registration fees, but participants are required to raise funds instead. 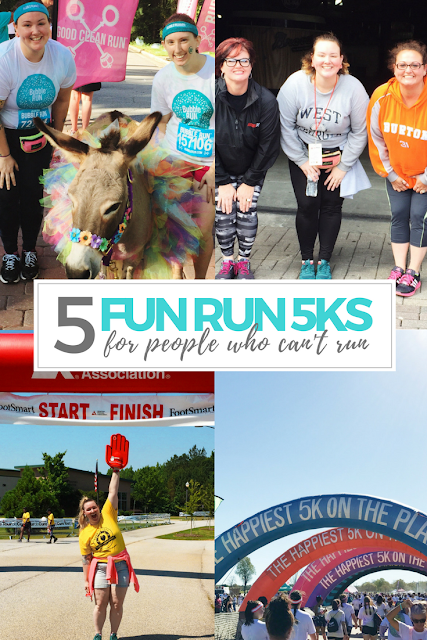 These may not typically have the same fun run aspects of others on this list, but these are great for the entire family and are for terrific causes. Tip: You can usually still donate after the race. Continue to support those charities! 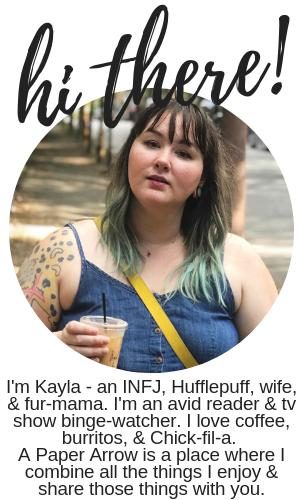 These may vary on whether there are "winners" or not, but these definitely are a ton of fun too, whether it's a Thanksgiving, Christmas, or Independence Day run, there are usually some fun aspects, too, like hot cocoa or burgers. Tip: Get festive. Dress for the holiday and get decked out. Inflatable runs are the newest in the fun run craze. It's an inflatable birthday party of your third grade dreams, but for adults! The runs include an inflatable obstacle course to navigate and roll through. These may be a bit tougher than a color or bubble run, but they're all in good fun. And I'm giving away one pair of tickets to The Inflatable Run below. Tip: Don't worry about how silly you'll look. Just get out there and have fun! I'm really excited to be participating in The Inflatable Run in Atlanta in May for my first 5k of the year. I'm also super excited to be partnering with The Inflatable Run to offer one lucky winner a pair of tickets for the 5k and the festival! You can enter using the Rafflecopter widget below. And everyone gets 10% off The Inflatable Run by using code APAPERARROW. What are some of your favorite 5ks? This giveaway is in partnership with The Inflatable Run. I really loved the color run and it’s been my goal to try some more of the the “fun” ones! I participated in the national kidney foundation 5Ks for a couple years as NKF is important to me, and one of my favorite memories is volunteering at Diabetes walks! I'm so glad to hear you've had great experiences at different walks and runs. I always enjoy the color runs I've done, and I'm excited to give the inflatable run a try, too!